What do a circus performer, a mythological warrior, and a famous entrepreneur have in common? You might be thinking: Not much! 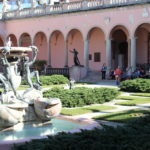 At The Ringling, however, all three are featured in an interactive museum experience entitled Superhuman in Sarasota. This guided tour, which was unveiled in the fall of 2014, introduces local students to the important artistic and historic legacies that exist in their community. Superhuman in Sarasota was developed to support ongoing efforts to provide every kindergarten through eighth-grade student in Sarasota County with offsite and in-school arts experiences. 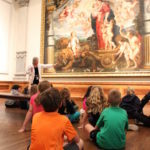 With this special program, every fourth grader has the opportunity to visit The Ringling at no cost and see local examples of individuals who have demonstrated superhuman qualities. This unique museum experience begins even before students arrive at The Ringling. Teachers receive a curriculum guide with lesson ideas to get students excited about the trip and to connect the tour content with fourth-grade learning standards in social studies and language arts. When it’s time for their museum visit, students join The Ringling’s volunteer docents to explore our collections of circus history and fine art. In the Tibbals Learning Center, students view the sprawling Howard Bros. Circus Model, which depicts a circus lot in miniature. They also try their hands at circus performance, balancing on a model tightrope and climbing into a clown car. In the Museum of Art, students analyze and discuss works of art that depict superhuman subjects. Throughout their museum visit, students encounter individuals who have exhibited exceptional courage, strength, skill, or vision. In the context of Superhuman in Sarasota, the daring circus performer, the worker who moved the traveling circus, the monumental sculpture of a famous hero, and even John Ringling himself are not that far removed from one another. All of these figures contributed greatly to the history and vibrancy of our region. At the conclusion of their museum visit, students extend their learning by identifying people living in their community today with superhuman qualities. Recalling the images they viewed in the museum, students are encouraged to sketch works of art celebrating those individuals. Since its introduction last year, fourth graders from 13 area schools have taken part in Superhuman in Sarasota. We hope that all Sarasota County elementary schools will take advantage of this exciting opportunity for students to interact face-to-face with Florida history and great works of art.